I know a guy who 25 years ago worshiped Neil Diamond. I had a hard time understanding this. While there's nothing wrong with Neil Diamond's music, it's just that at his age (26ish) I thought it was weird to be a fan of somebody more likely to be worshiped by my Mom or my in-laws (they did). Everybody has their thing though, so I get that. Back in the day, I knew a guy who used to travel from state to state following Bruce Springsteen on tour. The guy was a fanatic. While I never went to that extreme, I had a few favorite groups that I waited for their new albums every year. Then I'd go see them live. A few that I've seen multiple times include, The Cars, Eric Clapton, and George Thorogood all of whom I've seen five times each. That is borderline fanatical. It also probably explains my pulsatile tinnitus, a bit. Anyway, one of my all-time favorite bands is a group from Australia called The Church. The old cliche about "the first time I heard their album, it changed everything..." is absolutely true for me. 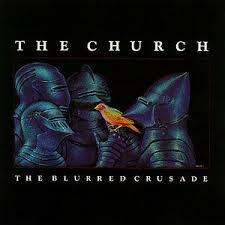 I remember it was my brother Paul's album and it was titled The Blurred Crusade. (This was in about 1984) It's one of those albums where EVERY song is a good song. It is what I refer to as my "Deserted Island Album" - the one you must have, (provided you have a record player on said island.) Great lyrics and layered, jangly guitars. Moody perfection. I love it. Now, I've followed them on and off ever since that time. Over the 30 years I've followed them, their style and substance has changed with every album, some that I really like, others not as much. Every album has its gems though. Despite being a huge fan of their work, I've only seen them live twice, once in Madison, and once in Minneapolis. I've kicked around the idea of seeing them in Milwaukee a couple of times, but never pulled the trigger. So, when I saw that they are coming on tour in the US again this spring, I was intrigued. Then I find out that their tour includes doing the entire...wait for it...Blurred Crusade album! My wife, who likes their older stuff as well, said maybe we should make a road trip out of it, down to Evanston, Illinois with an overnight stay and a trip into Chicago for lunch the next day. Favorite band, favorite album, in one of my favorite cities with my favorite girl. It all happens on April 25-26th. It's at a small venue called The Space, and we have guaranteed seats. It's a splurge in advance of our 26th wedding anniversary. A treat for sure! After the Blurred Crusade set, the second set will include some new stuff and some older hits as well. It sounds like the best of all worlds for someone who hasn't seen them since 1988. And this 54 year old fan who refuses to grow up, can't wait. Our event could not have gone more smoothly. Huge thanks to the amazing managers from this event venue for their consummate professionalism and outstanding hospitality. We look forward to many more years at this lovely place.